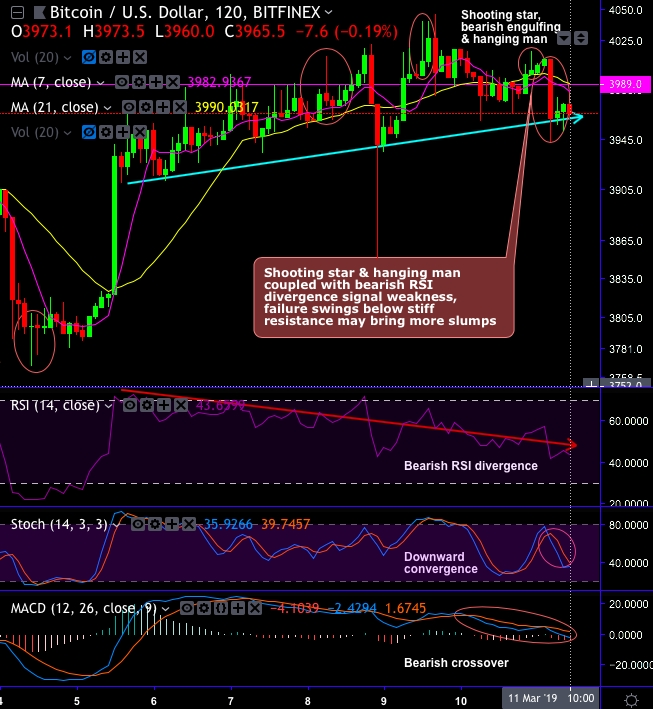 Please be noted that we have traced out RSI bearish divergence on BTCUSD, ever since then the last month’s rallies seem to have been exhausted and bears resume of late. In addition to that, the pair also forms shooting star, bearish engulfing and the hanging man at peaks of rallies (refer circular areas on 2H charts). The minor resistance levels are observed at near $3,989 - $4,100 and the major resistance near $4,620 (i.e. 7-EMA levels). The minor support areas are observed near $3,934 and $ 3,909 levels. Please be noted that the weakness, for now, is intensified upon bearish stochastic crossover, and RSI divergence in the medium and short-term trend. While the trend indicators (DMA & MACD) also show bearish crossovers that indicate downswings to prolong further. Intermediate trend breaches below range & retraces more than 78.6% Fibos with bearish EMA & MACD crossovers, bearish pressures imminent as a current price well below EMAs. This Wednesday the latest round of CBOE XBT (XBTH19) futures expires. These futures contracts need to be settled on a predefined date, based on contractual terms. All CBOE contracts will have to be traded, or settled, before this date. There is generally a dip in the trading volume of futures around expiration dates, that coincides with a rise in volatility and potential short/long squeezing.